Paul Reuter reflected on his brother at St. Anthony of Padua Church in south St. Louis at a prayer service and presentation of the first Dismas Award, given posthumously to his brother, a priest of the Franciscan province based in St. Louis. The province accepted the award on behalf of Father Reuter from the national Dismas Ministry, which serves prisoners with free Catholic Scripture, faith and prayer resources. 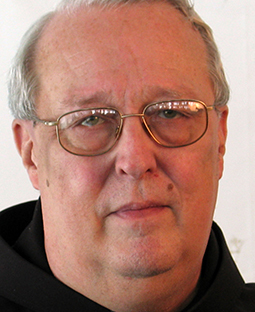 Father Reuter died June 30 at age 79 following complications from back surgery. The Reuter boys and their sister, Roselyn Simila, grew up in St. George Parish in Affton and attended the parish school. The family had several relatives on both parents’ side who were Franciscan priests and visited St. Anthony Parish often, so it was no surprise when Christian Reuter entered the seminary. They beamed with pride when he was ordained a Franciscan priest in 1966 and when he served as a teacher, counselor and principal at Hales Franciscan High School in Chicago, which has a mission of educating African-American males, and as pastor of two African-American congregations in Chicago. Their joy continued when Father Reuter was one of three Franciscans assigned to the Belleville, Ill., Diocese in 2002 to establish a Franciscan presence in East St. Louis, Ill. Bishop Wilton Gregory appointed him to direct prison ministry for the diocese. His role was to coordinate services in 12 prisons and other jails, said Franciscan Father Carroll Mizicko, pastor of St. Augustine Parish in East St. Louis. At the time, only three or four priests and a few other volunteers visited prisons in the diocese, “and by the time he died, over 50 priests, deacons and laypeople worked in prison ministry in the diocese,” Father Mizicko said. Father Reuter, with help from retired Bishop Stanley G. Schlarman of Dodge City, Kan., and Bishop Edward K. Braxton of Belleville, began Our Brother’s Keepers, a re-entry project to assist returning citizens when they leave prisons, a ministry that thrives today. Ron Zeilinger of Dismas Ministry said that when people in prison understand they are a child of God, they grasp that they can begin a new life. Father Reuter, he said, “remains a driving force” for reform of the criminal justice system. As a young priest of the 1960s, Father Reuter was involved in the Civil Rights movement. When the Rev. Dr. Martin Luther King Jr. came to Chicago, it was widely reported that the priest drove a truck that the Civil Rights leader used to deliver his speeches and experienced bricks being thrown at them from people opposed to the message of justice and equality for all. Brian Nelson, who spent 12 years in solitary confinement at Tamms SuperMax Prison, told the Belleville Messenger of the many times Father Chris came to see him and the other inmates. “He walked into that ugly, depressing and terrifying place, but treated all men of faith and those without faith as human beings guided by the caring hand of God as a beacon of light to wash away evil and oppression,” Nelson said. • Helps prisoners restore their relationship with the Catholic Church and God. • Sees the need for God in the lives of all who have been affected by crime. • Believes that prisoners are still members of Christ’s Body and should not be forgotten. • Reaches out to all who suffer the effects of crime: victims and their loved ones, prisoners, those released from prison and the community. • A Christian faith-based organization that is dedicated to the full integration of formerly incarcerated persons into the St. Clair County, Ill., community. • Grew out of the dreams of prison ministers in the Catholic Diocese of Belleville, Ill. After several years of experience inside the prisons of southern Illinois and with an ever-increasing awareness of parolees’ recidivism, they concluded that action needed to be taken to help the released avoid returning to prison as well. • For information, visit www.obkministry.org or call (618) 482-5570.